This Chocolate Peanut Butter Cheesecake Bundt Cake has so many delicious desserts enveloped into one insanely delicious recipe. 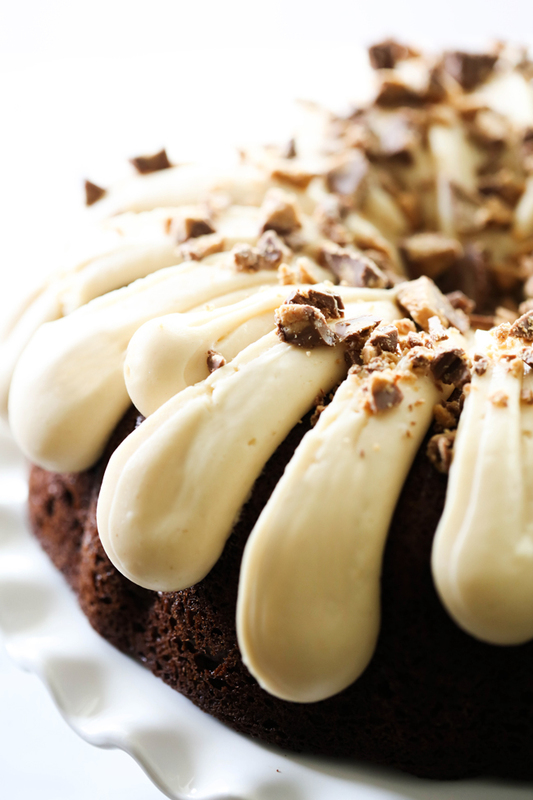 The bundt cake is dense and moist while the peanut butter cheesecake layer adds so much flavor and smoothness to each bite. 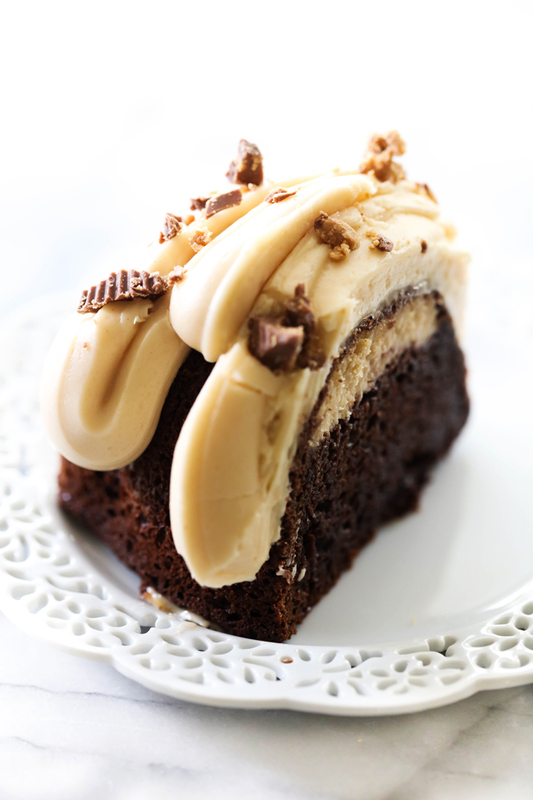 It is topped with a fantastic peanut butter cream cheese frosting. We just got back from such an amazing vacation. I literally ate my heart out and enjoyed a much needed break with my family! However, I am SO excited to get into the swing of all these yummy holiday seasonal and holiday recipes with you. 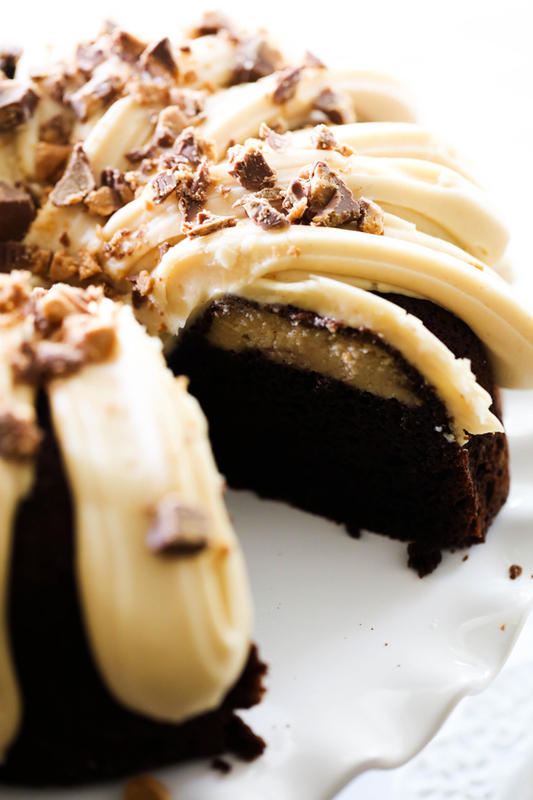 First up, this Chocolate Peanut Butter Cheesecake Bundt Cake. If you are a long time fan of this blog, you know Bundt Cakes are my jam. You will find a plethora here on the blog and one of them is sure to fit your taste and style. Today is for the Chocolate + Peanut Butter lovers out there… this one is for you and trust me, you are going to LOVE IT! Chocolate Bundt Cake. It is so moist and will top any cake recipe you have tried. It is dense, fudge and exactly the texture you want your cake to be. The Peanut Butter Cheesecake Layer is the perfect flavor and texture addition and a fun break up to the density of the cake. The Peanut Butter Cream Cheese Frosting is so simple yet such a powerful component of the recipe. Between these three components to the recipe, you are in for a real treat! Spray bundt pan well with cooking spray. In a large bowl, mix all ingredients and beat for 3 minutes. Carefully spoon filling over the top of the batter being careful not to get it near the edges. Spoon the rest of the cake batter over the filling. Bake at 350 degrees F. for about an 1hr and 5 minutes. Insert a long toothpick in the center of the cake to determine when the cake is done. The toothpick will come out clean. Invert cake onto wire rack to cool. In a medium bowl combine cream cheese, peanut butter and powdered sugar. Beat on high until creamy. When cake is cooled, pipe the frosting over the cake in a back and forth method. Sprinkle chopped Reese's over the top. I just made this cake today after not baking for a year after a difficult loss, it was a huge hit and everyone raved and wants the recipe. Thank you for posting a delicious cake recipe and helping me to feel like I can get back to doing something I really enjoyed.